Plantar Fasciitis is Latin for inflammation of the plantar fascia; it is the most common cause of heel pain and heel spurs. The plantar fascia is a thick fibrous ligament that runs from the heel to the ball of the foot. Its purpose is to support the arch and act as a dynamic shock absorber. Over time due to factors such as over-pronation (fallen arches), weight gain, a job that requires standing for long hours, age or sports activity the plantar fascia is placed under consistent stress, which leads to inflammation and pain. Plantar Fasciitis is a chronic injury, which develops over a period of time; therefore it cannot be cured overnight. Medical treatment solutions include cortisone-steroid injections, shock-wave therapy and in some case surgery. Some relief may be achieved with icing and anti-inflammatories (oral and/or topical i.e. cream). 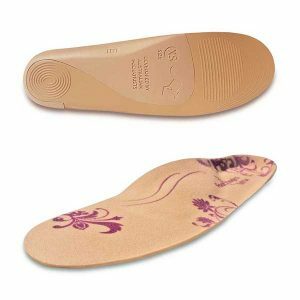 Orthotic shoe inserts are among the less invasive, more effective and cheaper ways to Plantar Fasciitis. Because of their high success rate and their low cost orthotics are now among the most recommended form of treatment by GP’s and foot specialists. Orthotics are designed to re-align the foot and support the arches. As a result, excess strain and stress on the plantar fascia ligament is greatly reduced. Orthotics address the cause of this medical foot condition, whereas most other treatments merely relieve the symptoms, providing only short-term relief. In Australia there are two types of orthotics: custom-made prescription orthotics and pre-made or “off-the-shelf” orthotics. Both types of orthotics will help relieve Plantar Fasciitis, as long as the device provides enough lift for the arch of the foot. Footlogics orthotics provide adequate arch support and have helped many thousands of heel pain sufferers in Australia and overseas. Footlogics has been approved by the NHS (National Health Service in the UK) and this Australian product is now used in hospitals across England. 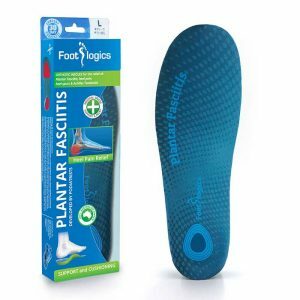 Footlogics Plantar Fasciitis is a full-length orthotic specifically designed by Australian podiatrists to target Plantar Fasciitis, heel pain and heel spurs. It fits all types of lace-up (or velcro strap) footwear, as well as work boots. This orthotic is also suitable for running shoes, cross-trainers and walking shoes. 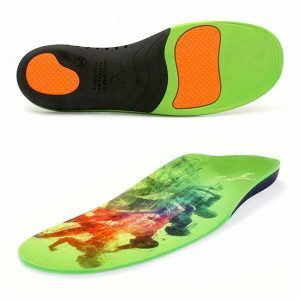 This insole features a high arch support and a deep stabilising heel cup, as well as a Poron shock pad under the heel. 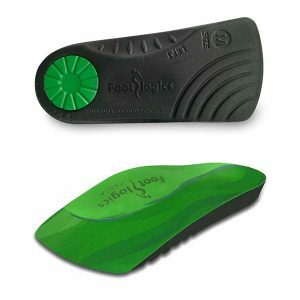 Footlogics Plantar Fasciitis orthotics are made of E.V.A a firm type of light-weight material that is firm enough to provide proper arch support, yet soft and flexible enough to make it comfortable to wear. 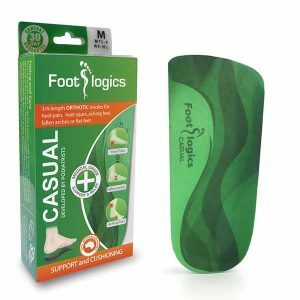 Footlogics Casual is a 3/4 length orthotic, designed to fit into footwear without laces (or velcro closures). Ideal for men’s and women’s slip-on shoes, provided the shoe has a low or flat heel. An easy and cost-effective solution to heel pain, knee pain, back pain or tired, aching feet and legs. 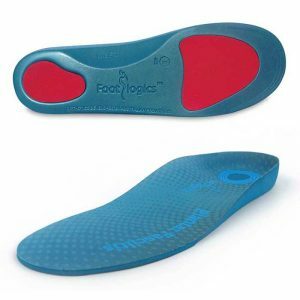 Footlogics Casual features Dual Layer Orthotic Technology. Strong and supportive E.V.A. combined with a soft 2mm Durapontex top layer makes this orthotic very effective and comfortable to wear, providing both support and cushioning. 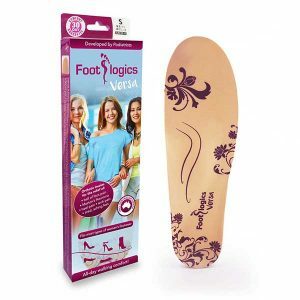 Footlogics Versa offers the ideal solution for heel pain (Plantar Fasciitis) in so called ‘hard-to-fit’ ladies footwear. I.e. shoes that are narrow or have a low back. Regular orthotics are hard to fit in a narrow shoes, plus they often are bulky and tend to push the heel of the foot out of the shoe during walk, especially if the shoe are quite ‘shallow’. Footlogics Versa takes up very little room inside the shoe, yet provides excellent biomechanical arch support, as well as metatarsal support (for people with Metatarsalgia or Morton’s Neuroma). 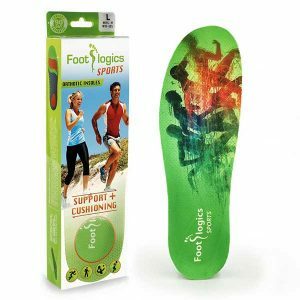 If you are a runner (or someone who walks more than 5kms per day) the Footlogics Sports orthotic is recommended for plantar fasciitis. This insole is made of soft, cushioning P.U. and gel, encased by a hard plastic shell on the outside to provide excellent biomechnical control. The materials used for this orthotic are more expensive and more durable compared to Footlogics Comfort and Casual, hence the price difference. If your heel pain has come about recently (in less than 3 months) and you have not yet tried orthotic treatment, we are quite confident that our product will be of assistance to you and greatly reduce or eliminate your heel pain. 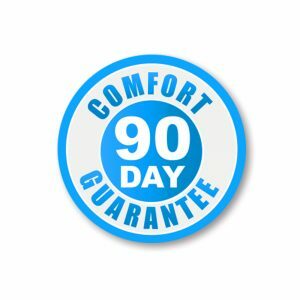 We invite you to try Footlogics orthotics for 90 days. If you find they have made no difference at all to your heel pain, you can simply return the product for a full money refund (including shipping cost). Please note that when using Footlogics orthotics for heel pain, we also recommend you follow our exercises program. Studies in Europe and the USA have shown that a combination of wearing pre-made orthotics and doing some daily exercises is a very effective way of treating Plantar Fasciitis.